Today’s Friday Photo is of Newhall Street which many people will remember was home to Birmingham’s Museum of Science and Industry before it moved to Eastside in the early 2000s. 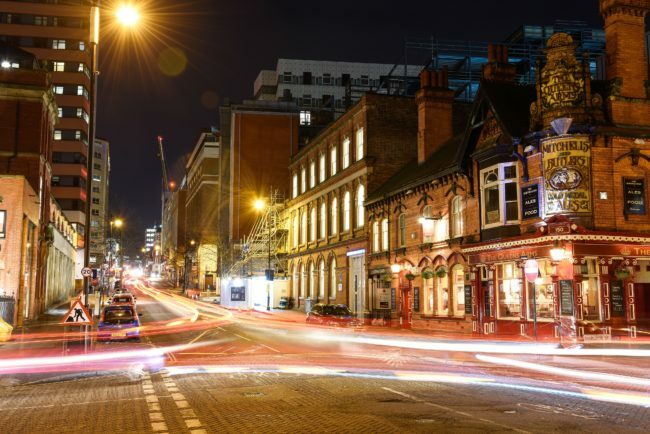 This stretch of road is the main route into the Jewellery Quarter and I spent almost an hour in the freezing cold taking many long-exposure shots last night. I didn’t plan to take photos that evening, but I had my camera with me and thought why not. Thank goodness I had gloves is all I can say. Originally Newhall Street was the driveway to New Hall which was occupied by the Colmore family – imagine a tree-lined driveway leading up to the Hall. Yep – today it looks a bit different doesn’t it. New Hall no longer exists, having been demolished in 1787 after the Colmores moved out but the remnants of its history live on today. Newhall Street has had many guises over the years and was named in 1766, after opening as a public street in 1746. At this point it was known as Newport Street and then eventually New Hall Walk. It’s hard to imagine the tree-lined street of the 18th century and that impressive hall that lay beyond its boundaries. But today it’s still one of my favourite streets and I’m happy i get to walk it every day and take in its fascinating history!